Auckland Transport have released their latest Auckland Cycling Account, which has become a great way for AT to highlight how cycling in Auckland is changing over time. 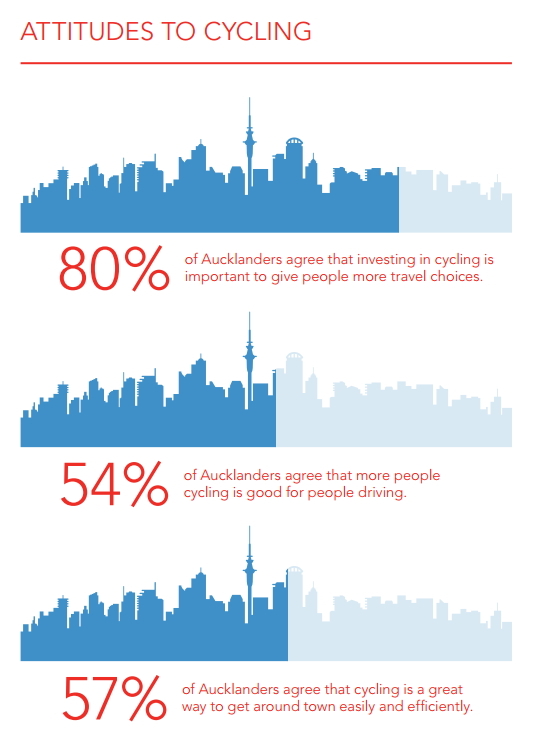 The account is filled with a heap of interesting facts and figures about cycling in Auckland. Auckland is experiencing a biking boom with a report released today by Auckland Transport showing big numbers taking to 2 wheels over the past year and confidence in cycling at an all-time high. Forty-five thousand people starting riding in 2016 and there has been a 62 percent increase in cycle trips in the city centre since 2013. 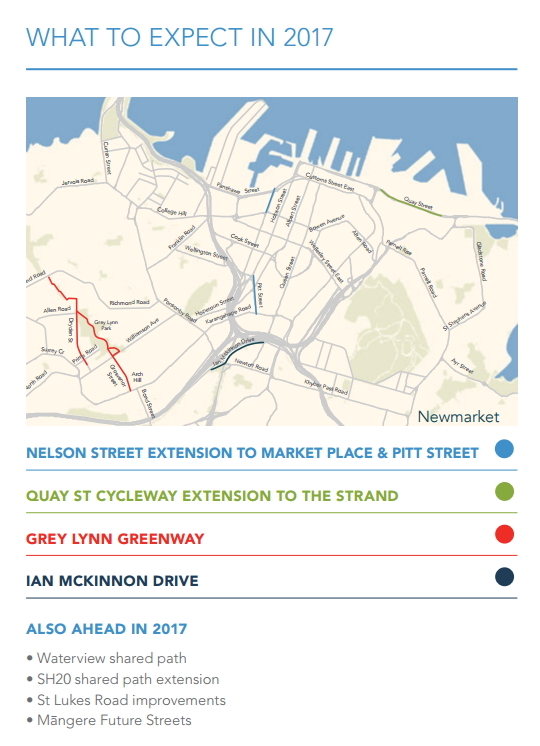 Bikes now make up 9.4 percent of inbound traffic via Upper Queen Street and on the Northwestern cycleway there has been a 27 percent increase since 2015. Grafton Gully has seen a 34 percent increase and the Mt Roskill Shared Path has gone up 16 percent. These numbers are in part due to the network effect as Auckland’s plan for high-quality cycling infrastructure is rolled out across the city. Auckland Transport’s Manager for Walking, Cycling, and Road Safety Kathryn King says, “We are now seeing what other cities around the world have experienced over the past decades. When you meaningfully invest in a well-planned cycling network, people will leave the car at home and take the bike to work or study. Here are some of my favourite bits from the report. It’s great that Auckland Transport are talking about the ‘network effect’, something that will only strengthen as more of the network is rolled out. 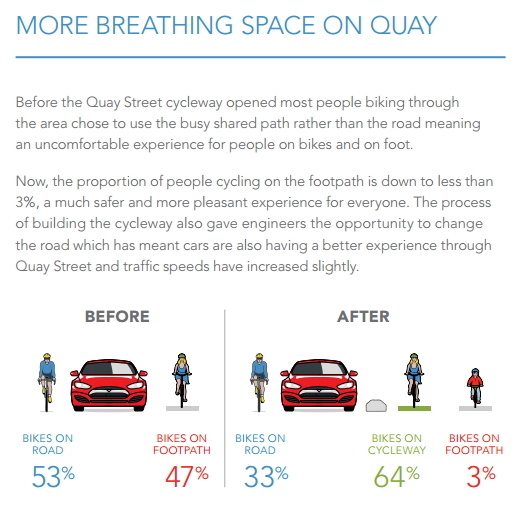 The Quay St cycleway hasn’t even been opened a year yet but there some interesting figures showing how by separating cycling out from the footpath and the road has made things better for other users. 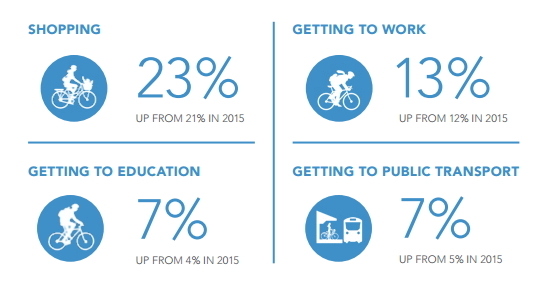 The reasons people use bikes, other than just for recreation and exercise, is increasing. Attitudes to cycling show strong support for investing in cycling. In addition they also say that 39% of Aucklanders are positive about the state of cycling in Auckland which is up from 22% in the 2015 account. 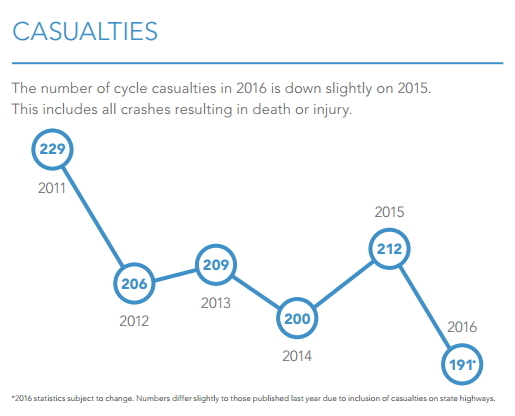 Despite a strong increase in the number of people on bikes, the number of reported causalities is heading down – although is still too high. And what’s expected for 2017, some of these are already well underway or even finished. While not all numbers in the report are good, for example some there are fewer primary and intermediate school students riding (but more secondary school students), overall there is a clear picture that cycling is improving. AT should really produce something similar for public transport. They have a will huge wealth of interesting information they can tap into to highlight some key insights about PT in Auckland, for example, where, when and who is using PT, what routes are performing best across different metrics (ridership, punctuality, reliability etc. ), where they’ve made improvements to the network and where they plan to next. There are so many things they could show that the biggest challenge would almost be what to include. I started cycling to work from Meadowbank last year and haven’t looked back. Huge change in how i feel about my city (and myself) and it only seems to get better each month as more improvements to the infrastructure are made. 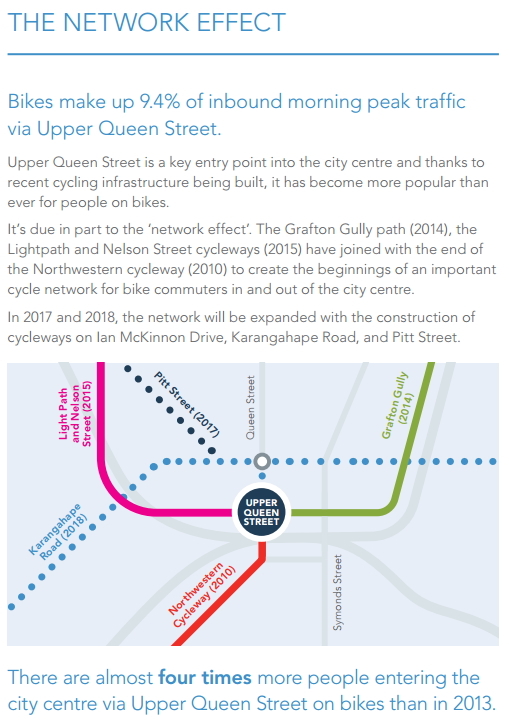 I’m looking forward to Stage 2 GI2T shared path to (begin) be completed – so i can feel better sending my kids on their bikes to school in the morning. Currently just the older one does and only on the footpath. I love cycling in Auckland. Keep it going with the new cycling projects! Can’t wait for the Waterview shared path to be opened soon, and then to move on with the Avondale-New Lynn path. The only other thing I’d like in the future is cycle lanes along Rosebank Road. The no stopping zones act as a buffer between traffic and the kerb but it doesn’t stop motorists veering into them. The city centre is the largest catchment for population and geographical area, so the funding has primarily gone into these areas. Due to the population sprawl of north, west, east and south Auckland, projects are a bit more difficult to implement. 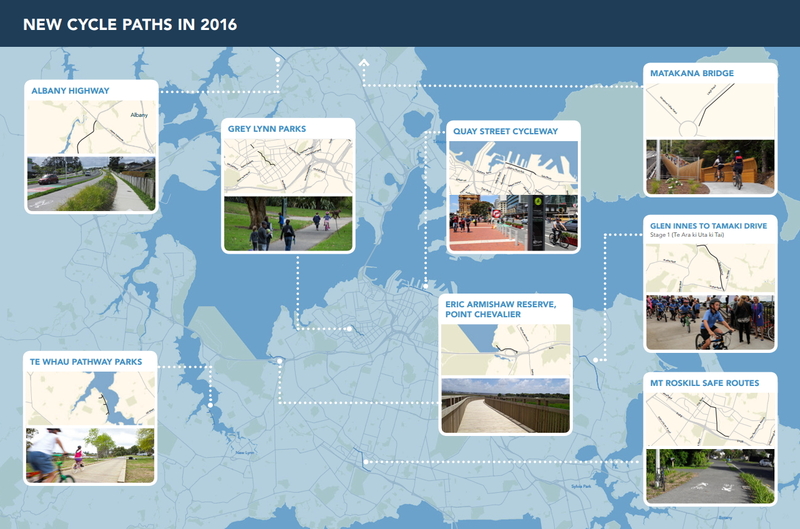 Good to see growth in the numbers using the centre area cycle ways though! I’m cycling to the train (1.5km~) Mon-Fri, would like to start cycling to and from work, but great south road through Takanini/Manurewa is not a pleasant place to be a cyclist, but I can understand improvements there are difficult and expensive to implement, so will probably be a while off. Plus there was future streets in Mangere, and a few other cycle lanes, and on NZTA’s side the shared path as part of the Southern Corridor Improvements. Many of the suburban areas would be very easy to get higher cycling rates but while the focus is predominantly on adults commuting to and from work, this is seen as far lower priority. How so? I’m not disagreeing with you, I just think it would be harder to do so. The city centre was essentially a trial (and boosted by the funds from central govt) and has made monitoring of uptake easy to follow to then provide solid data on the amount of people using cycle ways. Being the burbs would often be difficult to monitor how many people are using the cycle ways. The dominance of on-street parking would be difficult to remove, or would you propose more wider footpaths, and encourage the ‘shared use’ approach? “Neighbourhood Greenways” are a good level of shared use, suitable for many local access roads. What’s really important is to reclaim some local road space wherever the NZTA is telling us a roading project will reduce local traffic. Tiverton Rd and Wolverton Rd, for example, are going to have 13 to 15% less traffic, NZTA say, when the WC opens. New Windsor School has a school policy banning cycling to school, due to the traffic danger (unless that has changed since last year?) Now is the time to reclaim a lane in each of the busy roads near there, and replace it with a good cycle lane. #AKLBIKELIFE is booming there, too, but with a very different meaning. It’s brown boys on mountain bikes pulling wheelies and having fun on the road, and mounting PA speakers to their bikes. It’s the coolest/edgiest thing happening in bike culture in Auckland, but probably a bit too on the illegal/antisocial side for the advocacy groups to embrace. In terms of infrastructure – I’ve heard about the Mangere safe streets, and that’s about it. But it’s super flat out there, massive cycling potential! Great improvements. Certainly the number of people I know who now cycle regularly as part of their errands or commute is increasing. The drop in primary and intermediate school cycling is sad, but easily explained. The number of cars owned and used in each suburb, and noticeably the number of cars parked on the residential streets, is increasing year by year. These parked cars and car trips reduce the safety for both walking and cycling kids substantially, and lead to more and more parents deciding to drop their kids by car, which of course exacerbates the problem. It’s interesting to read that Primary School cycling hasn’t increased. This could be easily solved for free by allowing school students to cycle on footpaths. Cost/benefit would be infinitesimal. Yeah right: except for all the ACC claims when pedestrians are mullered. Cyclists illegally riding on pavements are a real menace. I run regularly around town and I’m fed up with having to dodge cyclists breaking the law. As I am running I don’t have the same amount of time to dodge bikes (some of whom travel at ridiculously fast speeds) as a walker does. I hate the parked cars on pavements but at least they are stationary. I’m all for more people on bikes:I have a bike but I ride it legally. I’ve been in Tokyo several times where bikes on footpaths are common but New Zealanders do not have the same politeness as Japanese. And yet statistics show cycling on footpaths in NZ is very low risk, even to pedestrians. Motor vehicles turning in / out of driveways and junctions are the biggest risk but you know, lets ignore that. Put it on that long list of ideas which work in most part of the world, but not in NZ because our legendary lack of any courtesy on the roads. I walk regularly around town and I’m fed up with having to dodge runners speeding past, headphones on expecting walkers to get out of their way. As I am walking I don’t have the same amount of time to dodge runners (some of whom travel at ridiculously fast speeds). I agree, Matthew. I think we also need to look at what measures we could do to increase the safety of children on the footpaths. Perhaps there is a cheap judder bar that anyone with a driveway of limited visibility should be required to install? And an education campaign to accompany the change, in which it is made clear that people driving out of driveways need to proceed slowly. Yep, driveways with poor sight lines are one of the things that scare me the most with kids. Having said that most accidents happen within the driveways I believe. The accident was on the other side of road not in driveway. Child crossing road car traveling along Sarsfield St. Sounds like you know more about it than what was reported. Maybe you also know what the outcome was — was she OK? Interesting. Note that members of the AT cycling and walking team suggested closing Sarsfield St at the Curran St end to create a safer cycling environment, with residents needing to go back up to the actual arterial road – Jervois Rd – to access the rest of the city. It would have cut out the through traffic, and left the local access roads as just that, local access roads. But I believe the suggestion couldn’t even get past the blue suits to be proposed to the public. That shared driveway / prive road looks like it has the necessary sight triangles where it meets the main road. That’s why you see the low planting of agapanthas so that drivers can see over. Worse, it has gone backwards. This should be very embarrassing for Auckland Transport. Auckland used to have a bylaw limiting a front fence to 1-1.2m. Interesting. Fence height has a large influence on safety in the area, and not just for cyclists on the footpath. Fence height is still an urban design consideration for Resource Consent, but I’m not sure about existing houses. You see a lot 1.8m fences going hard up against the footpath with no visibility for pedestrians/drivers. Maybe there should be a push for a ‘stop sign’ at property boundary (rather than road edge) and/or 5km/h speed limit at driveway crossings perhaps? And suitably punish people who break the rules? How about a raised table for the footpath, with a mandatory bump-up and bump-down for vehicles crossing. At least, where visibility is poor. Might take a while to retrofit 1000’s of these things though. Great results. I hope they keep up the expansion. I started cycling to work last year after quitting at Uni several years back. It’s great. Just need a more connected network and the numbers will just keep growing. The drop in cycling for kids could be partially accounted for by more kids using scooters these days. I see lots of kids using scooters going to the local intermediate schools in Balmoral and mt Eden and when i visited Balmoral intermediate a few months ago their bike lock up area was half filled with scooters. It would be interesting if AT also recorded information on scooter use. It would be good if they do, because I imagine scooters are an increasing transport mode. They are increasingly being used by older people with a slight level of disability that makes cycling hard. I met a woman at a cycleway design meeting last week, who is importing and modifying scooters as a business, for this purpose. The scooters are more the size of a bike than the little ones kids sometimes have. That would make terraced houses more or less impossible to build in Auckland. The amount of space required to turn a vehicle around on a property is astronomical. 1) Bit counterproductive to have people stop in the road and reverse backwards across the footpath, exact same problem no? 2) They do according to the unitary plan, except in the high density zones where you’d hopefully be building larger apartment comples anyway. I was told that the statistics show that reversing into the driveway is much safer than reversing out. Presumably it is because you can see the footpath in both directions then. But the reason I was actually given is that people’s brains are engaged with lots of distractions when they are setting out on a journey, less so when they’re arriving home. I have noticed, though, that when the most likely danger is driving over one’s own children, it’s easier to figure out where they are on the property before leaving, than before arriving… so there must be a trade-off. Better solution, of course, is having a driveway fenced from the rest of the property. Best solution, of course, is not having car. 1) no, it isn’t; reversing in is far safer than reversing out, mostly because when you reverse in you see the footpath as you drive past (so can assess whether there are pedestrians coming) and at least a few metres of the footpath are always visible, either in the passenger window, or in the mirrors. 2) For now. That should be changed ASAP. Reversing out ought to be ok, as long as you SLOW RIGHT DOWN before you cross the footpath, or better still, ‘stop and proceed at caution’ (good railway term there!). Unfortunately, although it doesn’t take much to do this, some drivers are too ill-disciplined to bother and just blindly barge backwards across the pedestrian thoroughfare.